Xiaomi seems to have a lot of exciting hardware in the pipeline at the moment. We are still anxiously awaiting the Mi Mix 2s, with its alleged next-gen full-screen display design. All the while another intriguing device is appearing on our radars every now and then. 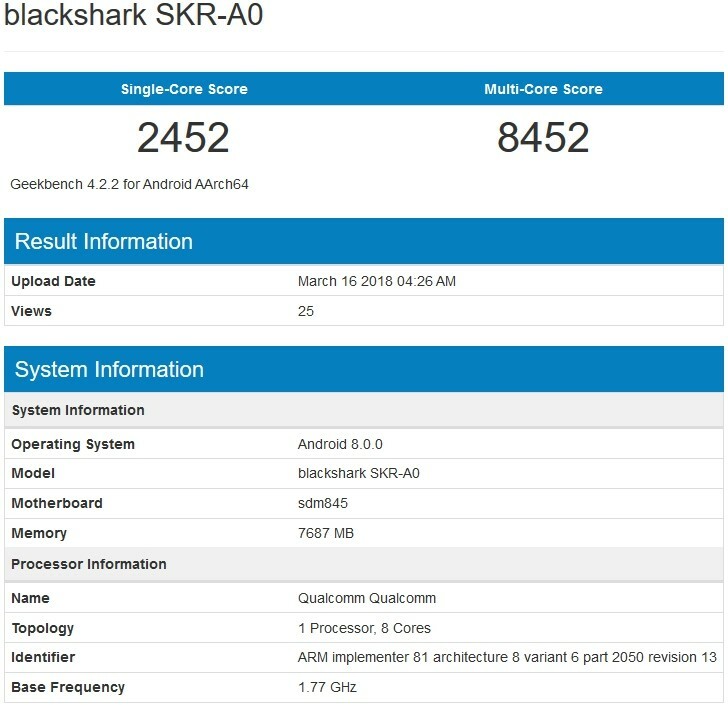 A recent GeekBench listing sheds a bit more light on the phone, designated as the Xiaomi Blackshark SKR-A0. The benchmark report shows a Snapdragon 845 chipset and 8GB of RAM. The scores themselves are surprisingly high, even for Qualcomm's latest silicon. Insider sources claim this this is due to a new aviation-class cooling solution, to keep the CPU and GPU from thermal-throttling under load. That's just one one the many hints that the Blackshark SKR-A0 is the first of a new line of gaming-oriented smartphones, by Xiaomi. Digging further into the matter, links Xioami and the device in question to a company called Black Shark Tech inc., which the Chinese manufacturer partially owns. While not really in the smartphone business, Black Shark Tech specializes in some rather interesting OCR solutions and mobile camera research and development. This fits in nicely with rumors of a top-class DSP on the mysterious new phone, with some form of special sauce involved. Other than that, we can only assume the Blackshark branding rights come courtesy of the company. It's a cool name, no doubt and one that oddly matches up with one of Razer's gaming headset lines. There is probably no connection there, though, since the Blackshark SKR-A0 could be a very direct competitor to the Razer Phone, which only recently tried to put a traditional PC gaming spin on the mobile market. As for other intel about the Blackshark SKR-A0, there is also a recent AnTuTu listing that reveals some potential specs. Apparently, Xiaomi will stick with a 2160 x 1080 pixel display - lower resolution than the Razer Phone. That could be more beneficial to good performance and power efficiency. 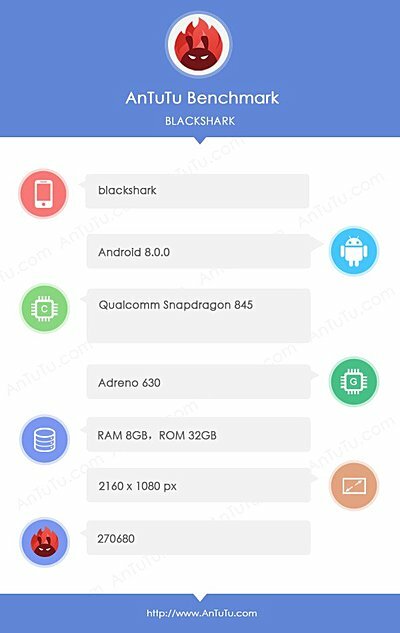 AnTuTu also mentions Android 8.0 for the Blackshark. But S8 can adjust the resolution down to 720p if you haven't know that feature yet. S8 needs to drive twice the number of pixels as op5t afaik. So I think performance might be impacted a bit... Wait for meizu with same chipset and fhd screen to compare..